The direct probe technique has been routinely used for the analysis of samples via the mass spectrometer for more than 30 years. It had its beginnings in the early stages of the development of the mass spectrometer before the GC was interfaced to the mass spec. The technique has the advantage of being a quick method of introducing solid matrix samples directly into the mass spectrometer. It has been widely used by many laboratories for the routine analysis or screening of a large number of samples in a short period of time since the analysis time is usually only about 1 minute per sample. The major applications have been in the analysis of forensic drug samples, pharmaceuticals and polymers. It is also very useful as a quality control method where large volumes of samples need to be analyzed. This high productivity is a major advantage of the technique. In addition direct probe permits the analysis of many samples that would be impossible to chromatograph or introduce into the mass spectrometer via other techniques. The direct probe has now been interfaced to the Agilent 5973 and 5975 MSD by Scientific Instrument Services. Through the use of this highly sensitive mass spectrometer and the use of the ChemStation software which permits fast sample analysis and background subtraction, mixtures of samples can be analyzed and the components resolved and identified. The direct probe in conjunction with the 5973/5975 is a proven powerful and highly productive method for the analysis of a large number of samples. Scientific Instrument Services has designed the new direct probe and probe inlet specifically for the Agilent 5973/5975 MSD. It will not interface to other models of the MSD. The use of a direct probe on previous versions of the MSD was not practical because the sources of these instruments (Models 5970, 5971 and 5972) were indirectly heated by the GC/MS interface. When the GC/MS interface was removed to allow for the introduction of a probe, another source heating system was needed to heat the MSD source. The Agilent 5973/5975 has a directly heated source which now permits the development of this new direct probe. The direct probe system consists of four major components, the direct probe, the probe inlet system, the electronics console and the PC software for probe control. The probe inlet system mounts onto the HP 5973 MSD transfer line port where the GC normally was interfaced to the MSD. This requires the venting of the MSD and the removal of the GC and GC/MS interface in order to install the probe inlet system. After venting the MSD, this installation can be completed in about 30 minutes. The probe inlet system mounts onto the side of the MSD and provides the probe valving and pumping system to permit the direct probe to enter the MSD vacuum system with minimal air introduction into the MSD vacuum system. An auxiliary vacuum pump is attached to the ¼" tube at the end of the roughing valve to enable the evacuation of the probe inlet system. The probe inlet consists of two quarter turn valves. The main isolation valve permits the probe to pass through the valve and mate to the MSD source. The second roughing valve enables the auxiliary vacuum pump to partially evacuate the area in the probe inlet system between the tip of the probe sealed against the first vacuum seal and the isolation valve. The SIS dual PTFE sealing system provides for exceptional vacuum sealing against the probe rod as well as long seal life. The probe inlet system contains an indexed dual guide rod. The direct probe is only ¼" in diameter. This small diameter provides for minimal surface area and therefore less resistance when inserting it through the PTFE vacuum seals. The small size of the probe and handle also make it easy to handle and use unlike other probes which are big and bulky. The probe tip is heated via a rapid response resistance heater and temperature feedback and control is accomplished with a thermocouple attached to the probe tip inside the probe rod. Also inside the probe rod are two gas lines for cooling. The gas IN line extends to the tip of the probe to provide cooling directly on the heater coils. The electrical, thermocouple and gas lines are directly connected to the probe and into the electronics console. Flared glass sample vials are used to contain the samples for analysis. The flared glass sample vials permit the efficient introduction of sample (both solid and liquid samples) into the glass vials and are easy to insert and remove from the direct probe tip without vial breakage. The direct probe tip contains a spring contact to gently hold the flared glass sample vials in place. For easy sample setup, a 12 hole sample vial block is included with the system. This block can be placed onto a hot plate to gently evaporate solvents from samples injected into the sample vials. 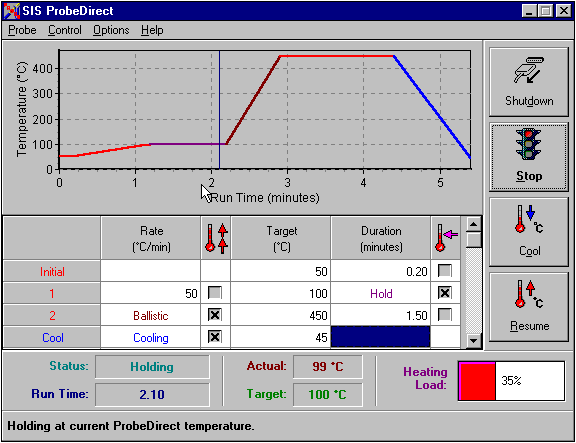 User setup and control of the probe heating and cooling is accomplished via a PC control window which is fully integrated into the HP ChemStation software. The direct probe can be ballistically heated to 450 degrees at ramp rates in excess of 500 degrees C per minute. This provides for fast removal of the samples on the probe and into the mass spec for analysis. In addition the probe tip can be programmed at ramp rates from 1 to 400 degrees per minute. At the end of the ramp the probe temperature can be held at this temperature for a timed interval before a second ramp is applied. Up to 14 ramp steps can be programmed via the PC window controller. After the sample analysis is complete the heater current to the probe is turned off and the compressed air cooling gas is turned on to lower the probe tip temperature to enable the removal of the probe through the PTFE vacuum seals of the probe inlet system. The PC control software fully integrates with the HP ChemStation software to not only control the probe parameters but also to store the probe parameters within the ChemStation method files and data analysis files. The user inputs the probe temperature, ramp rate and time parameters into a PC window, however the actual control of the direct probe heating and cooling is accomplished via the Direct Probe Electronics Console. The direct probe electronics console contains its own microprocessor which receives input from the PC to tell it what temperatures to heat the probe to and at what rate as well as the starting and stopping of the heating and cooling cycles. The direct probe electronics console uses this information from the PC to control the actual heating and cooling of the probe as well as the operation of the solenoid valve to permit the introduction of cooling air into the probe. The electronics console is interfaced to the PC via an RS232 plug which plugs into a serial port in the PC. The electronics console in turn has a cable interfaced to the direct probe that contains the heating cable, thermocouple cable, air cooling and air exhaust lines. The sampling method in ChemStation is set up. This normally is a short analysis time of 1 to 3 minutes. The sample is set up in the sample vial, solvent evaporated if necessary and then inserted into the probe tip. The probe is inserted through the vacuum lock as described above. After sample analysis the probe is backed out of the source to the third index stop (approximately 1 cm from the source) and the cooling cycle which began automatically continues until the probe cools to the point where it can be removed from the inlet system. The probe is removed through the vacuum lock system, closing both the isolation and roughing valves. In studies completed at Scientific Instrument Services to date, the complete injection analysis and removal of a sample can be accomplished in less than 3 minutes per sample (data analysis and interpretation takes longer). The sensitivity of the Agilent 5973/5975 has proven to be phenomenal when used with the direct probe. For the analysis of Caffeine we have been able to analyze samples with detection limits (full scan mode) down to 1.0 ng injected. Routinely we analyze 50 ng sample sizes via the direct probe technique and get library searchable and identifiable spectra of the known and unknown analytes. This sensitivity level is comparable to the older 5971 and 5972 MSD instruments for the analysis of GC samples. In addition we have been able to analyze and resolve mixtures of drugs using the direct probe technique. Multiple analytes in a sample will have different boiling points that will be thermally removed from the probe sample vial at slightly different times. Therefore the analytes can be separated and analyzed via the ChemStation software. Granted the total ion chromatograms look like poorly resolved packed GC column data, but the ChemSation software can separate the components using the background subtraction techniques. For additional details check out the direct probe application notes.